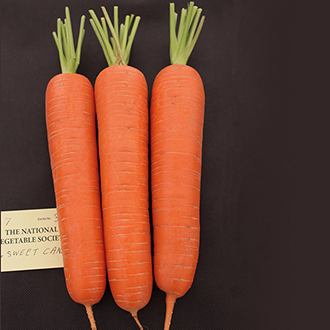 This superb carrot is rapidly building up quite a reputation with exhibitors! Roots are very uniform, smooth-skinned and blunt-ended. Both internal and external colour are superb and the delicious, cylindrical roots are topped with strong, vigorous foliage. Sow outdoors thinly, mid April - June direct in final position, or March - April under cloches, 1.5cm/half-inch deep. Rows 30cm/1ft apart, thin out to 10cm/4in apart. Undamaged roots may be stored over winter. Remove foliage and place in boxes or trays of dry sand. Harvest June-October.